Suey, from It's All About Books, has been posting lately about books that are discussed at the bookish events that she attends. On one such list was this book. I had never heard of it before, but I love fairy tale re-tellings and wanted to attempt the Short Story Quest for the Once Upon a Time challenge. So, I took a risk and bought a copy. Overall, it was a fun collection. I am glad I took a chance on it and had a lot of fun reading it. Like all short story collections, some stories were better than others, but still, it was pretty good. 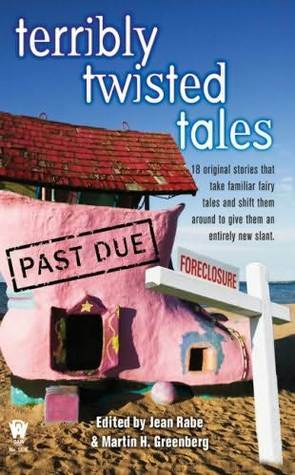 I read this story and the very first few sentences fully convinced me that this is not your typical fairy tale collection. This is a retelling of Hansel and Gretel, but includes cameos from other fairy tale characters. This is also reminds me that McKiernan is an author that I have a series on the go by... It was different, that's for sure! In this story, an author I have never heard of before, sets the record straight about who Golda Lockes (Goldie Locks) really was and what she really was doing living with a bunch of bears. I think she did a good job setting the record straight. What this retells should be clear from the title, but with seven being a popular number in fairy tales it never occurred to me that it was retelling of Snow White and the Seven Dwarfs. I liked the overall idea of this story, actually. This story is by an author that my eye tends to fall on when I am in the bookstore, but this is the first time I actually have read him. It was an interesting retelling of Puss in Boots and includes a bit different Jack than the one we are used to seeing. This was entertaining. Jack reappears ago, but with a very strange twist that you are probably not expecting! A common characteristic in fairy tales and fantasy is the power behind a persons real name. This story is about just how powerful a name is and is essentially also a retelling of Rumpelstiltskin (did I actually spell that right?). I am not entirely sure what this is a retelling of, to be honest. Retelling of 'Little Red Riding Hood'. This story is very popular at the moment with the movie release and there are actually a couple re-tellings. This is a bit more of an empowering story version. This is a re-telling of 'Peter Pan', which is not something you see very often, so I enjoyed it! An interesting re-telling of 'Rapunzel'. Again, a bit more empowering. This story still depressed me, but it was a bit different than the original tale and I am not entirely sure I agreed with the ending, but I suppose it makes sense. 'Sleeping Beauty', of course. I have always, and continue to, HATED the original versions of this fairy tale. This wasn't so bad, I suppose. At least when the princess awakes they don't get married that second and live happily ever after. Re-telling of the famous Goat story. It was an interesting retelling. Look at the common idea of three wishes found in stories. I really liked this story by the end. Another re-telling of Red Riding Hood. It includes a character that I think was likely modeled off Sherlock Holmes. Sounds fun! I've only heard of a couple of the authors though. That cover alone makes me smile! Ha... What a cool collection. I need to see if my library has this one. Glad to hear you enjoyed it!